Ralph Smith, managing director of the Campaign for Grade-Level Reading, will lead a panel discussion with a diverse group of funders who are focusing on investing in education solutions for families. Learn from funders themselves about the strategies, results, and initiatives that are rising to the top in their giving portfolios. You will hear from Dorian Burton, assistant executive director at the William R. Kenan, Jr., Charitable Trust; Karen Ortiz, vice president of Helios Education Foundation; and Tony Peyton, program officer at the C.E. & S. Foundation. 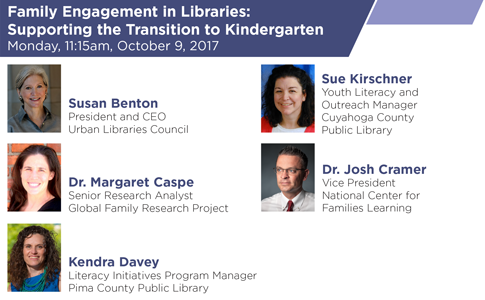 What role does a library play in a child’s transition to kindergarten and how is that role changing? Hear insights from Susan Benton, president and CEO of the Urban Libraries Council; Dr. Margaret Caspe, senior research analyst for the Global Family Research Project; Sue Kirschner, youth literacy and outreach manager of Cuyahoga County Public Library; Kendra Davey, literacy initiatives program manager of Pima County Public Library; and Dr. Josh Cramer, vice president of NCFL. Brought to the Conference by the Urban Libraries Council and NCFL, this live webcast is sponsored by Better World Books. Start Tuesday, October 10, off with an energizing breakfast and discussion with GED Testing Service® CEO, Randy Trask. Got a burning question in adult education? Participants will have the opportunity to ask questions of one of the premier minds in adult education both in person and using the hashtag #AskRandyTrask on Twitter. Hear from the nation’s preeminent leaders working to drive positive outcomes for black men and boys. A highly engaging panel will be led by Dorian Burton, assistant executive director at the William R. Kenan, Jr., Charitable Trust and co-founder of the TandemED Initiative for Black Male Achievement and Community Improvement, which is both a local and national initiative focused on scholarly excellence in promoting research, practice, and policy that create pathways to success for black men and boys. Dorian will lead an important and eye-opening discussion with Leon Ford, founder of Leon Ford Speaks, LLC; Dr. Robert Simmons, vice president of strategy and innovation of Campaign for Black Male Achievement (CBMA); and Trabian Shorters, founding CEO of BMe Community. You won’t want to miss hearing Terri Clark, Arizona literacy director, and Lauren Zbyszinski, PhD, director of professional learning and sustainability in the Arizona Department of Education as they present their innovative partnership work in the state. Read On Arizona is the state's early literacy initiative focused on improving outcomes for children ages birth-8. Effective leadership in today's highly complex environment requires the ability to work with partners and stakeholders to implement effective strategies that address the challenges all communities face. In this session, participants will explore the challenges and success of developing and implementing collaborative, results-focused strategies, holding mutual accountability for continuous improvement, and accelerating aligned action to achieve collective impact focused on early literacy. The Superintendent’s Family Literacy Roundtable presents an opportunity for attendees to engage in a discussion of family literacy from a school-system level. The roundtable will explore strategic decisions that can be made from the top that result in high-quality family literacy programming. You will learn how to engage your district leadership in the importance of family learning. Topics such as how to fund family literacy, successful family literacy staffing structures, and family literacy-centric decision making will be primary themes. Participating superintendents will participate in a facilitated panel discussion followed by questions from the audience. NCFL board member and former superintendent of Lincoln Public Schools and Puyallup Public Schools, Dr. E Susan Gourley, will facilitate the discussion with Dr. Jim D. Rollins, superintendent of Springdale Public Schools; Dr. Brian T. Binggeli, superintendent of Plano Independent School District; and Dr. Martin W. Bates, superintendent of Granite School District. This session will feature pioneering education and human services leaders on 2Gen approaches and opportunities for communities to drive state policy for two-generation outcomes across party lines: featuring leaders from Arizona and Colorado, with national expertise from Ascend at the Aspen Institute, this session will highlight the policy opportunities for 2Gen approaches in key states with a focus on how local leadership and on-the-ground efforts can inform and mobilize policy changes for children and their parents together. This session is designed to inspire educators as they learn about a family literacy model with over 27 years of proven success. This session will address the achievement gaps for American Indian children and schools as well as how to support parents/primary caregivers in their role as their child’s first and most influential teacher. Hear a panel discussion that includes the partners that support the FACE initiative: the Bureau of Indian Education (BIE); National Center for Families Learning (NCFL); Parents as Teachers (PAT); and Research & Training Associates, Inc. (RTA). Do you fully understand the impact of Unconscious Bias on your professional and personal effectiveness? All evaluative processes by people about people—such as when, where, why, and how we work with parents/guardians, learners, educators, community partners—are affected by unconscious bias. This interactive and experiential workshop will introduce the concept of unconscious bias—the mental shortcuts our brains take to help us make decisions quickly. This workshop is for you if you'd like to develop a deeper understanding of the filters through which you view the world; explore key learnings about the mind and the research that underlies unconscious bias, and identify ways to break the biases that hinder human engagement and collaboration.